While many of London's major attractions do charge, at times, quite substantial entrance fees ,there are still a number of real gems where visitors can wander around at their leisure free of charge. Some take a little bit of forward planning (like the Ceremony of the Keys ritual at the Tower of London for example) but for most it's just a case of turning up and getting stuck in. From cathedrals to historic houses there's something here to suit most tastes. 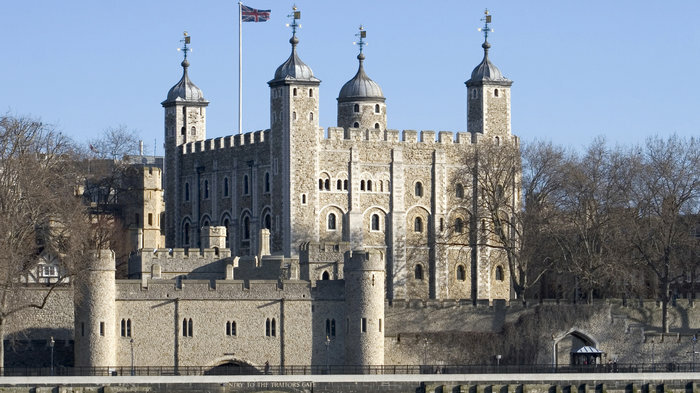 Unfortunately, it does cost to visit the famous and historic Tower of London, however visitors can attend the Ceremony of the Keys, which takes place every evening in the grounds of the palace, for free. Every night the Tower of London is locked up by the Chief Warder who makes his way to the gates from the Byward Tower at exactly 9.53pm. Once all the Tower gates are locked, the Last Post is sounded by a trumpeter and the ceremony is concluded. This ceremony represents a 700-year-old tradition and lasts no more than 10 minutes. The Chief Warder represents the Yeoman Warders (more commonly known as 'Beefeaters') who have looked after the Tower since the 14th century. Today they perform the role of tour guide in addition to their ceremonial duties. You can't just turn up, you need to plan this at least two (sometimes three) months in advance so this needs a bit of organisation to pull it off. To apply send two possible dates you can attend, in two or three months time, and a self-addressed envelope detailing names of attendees to: Ceremony of the Keys Office, Tower of London, London, EC3N 4AB. You can list up to six people from 1st April to 31st October, and up to fifteen from 1st November to 31st March. Home to the two seats of Parliament – the Commons and the Lords – visitors are allowed free access to the Public Galleries in both Houses where they can watch debates when parliament is in session. You don’t need tickets in advance, but may have to queue (waiting times of one or two hours are usual). If you're a UK citizen and would like to attend the popular Prime Minister's Question Time (Weds 12 noon, when Parliament is sitting), you can apply for tickets from your MP or from a Lord. Overseas visitors and UK residents without tickets can queue, but ticket holders take priority. The building began life as the Palace of Westminster in 1042 as a royal residence under Edward the Confessor. The major structure to survive various fires, Westminster Hall was built between 1087 and 1100 and is one of the largest medieval halls in Europe with an unsupported hammerbeam roof. As well as listening to debates you can enjoy a free guided tour of the Houses of Parliament. UK residents can tour both houses for free throughout the year, but will typically have to apply to their MP or a Lord six months in advance. Overseas visitors can tour Parliament on Saturdays and during the Summer Opening when paid-for tickets can be bought. A rich collection of famous paintings are housed within the walls of this neoclassical villa perched by a lake on top of Hampstead Heath. Works by Rembrandt, Vermeer, Turner, Reynolds and Gainsborough form the property's famous Iveagh Bequest. Handed down to the state by the house's owner, brewing magnate Edward Cecil Guinness, admission to the house and its collection of artworks is totally free to the public. Remodelled between 1764 and 1779 by Robert Adam, Kenwood features a lavish library and elegant array of rooms which provide a fitting backdrop for this notable artistic collection. Spectacular views and woodland walks provide an equally becoming setting for the house itself. A series of outdoor music concerts take place in the grounds during the summer. While tickets to the concerts will set you back a pretty penny, you can often hear strains of music and glimpse the sparks of fireworks if you find a spot nearby. Universally known as the Old Bailey, the Central Criminal Court of England is probably the most famous criminal court in the world and has been London's principal criminal court for centuries. Today's courthouses, opened in 1902, are built on the site of the famous Newgate Prison, home to some unsavoury characters and particularly public executions. Thankfully things are a little more civilised these days. While there is no public access to the precincts of the Central Criminal Court, public galleries are open for viewing of trials in session. There's no access to under 14s and big groups are advised to contact Head of Security in advance. Case listings can be found on the Court Services website. As you stare across the river at this bustling, stylish, multi-faceted venue, it's hard to believe that this riverside warehouse was once a reprocessing plant for the Oxo Company, ripe for demolition only a few decades ago. The Oxo Tower now stands out, loud and proud, flanked by two green open parks and the colourful Gabriel's Wharf, with a riverside walk guiding amblers up to its refurbished doors. One of the main attractions is the free viewing platform on the 8th floor which provides spectacular panoramic views over the city. There's also free admission to the gallery@oxo exhibitions and the Coin Street Festival every summer. Visitors now come in their droves to explore the shops, restaurants, free galleries, cafes and studios that populate this once barren area. The best way to experience the Oxo Tower and Gabriel's Wharf is as part of a leisurely riverside walk along the South Bank; taking in Tate Modern, the Globe Theatre and all the many pubs and sights that adorn the banks of the Thames. Home of the Royal Ballet and The Royal Opera, this impressive building in the heart of Covent Garden has been playing host to every major star of the classical music world since 1858. If you're heavily into ballet and opera then this is the place to come for high-quality performances in grand surroundings. If you're not, and just want to explore the building itself (especially Floral Hall - the building's dramatic glass atrium) and get a small taster of what goes on here you can wander around the spectacular construction for free during the day. There's also free chamber music every Monday, along with free jazz, free lunchtime concerts and recitals. Concerts start at either 12noon or 1pm and tickets can be booked online. In the summer, The Royal Opera House also broadcasts live opera and ballet to locations around London including Trafalgar Square and Covent Garden Piazza. The third theatre to be located on this site, most of the existing venue - with the exception of the auditorium, facade and foyer which are originals from 1858 - is the result of a detailed reconstruction in the 1990s. Located in an unexpected and fairly barren area on the edge of north-west London, this amazingly spiritual and architectural gem is free to visit and well worth the trip out to the suburbs - in fact the bleak location makes the beauty and symbolism of the temple all the more spectacular. The first traditional Hindu Mandir in Europe, every one of the 26,300 individually carved pieces that make up its entirety were carved in India and shipped over to London. All of these pieces were then fitted together in just three years, between 1992 and 1995. Inside and out, this place is absolutely stunning. The stark white exterior, riddled with intricate detail and carvings, belies an opulent, colourful interior. Highly-fashioned pillars, domes, columns, carpets and ceilings provide the setting for some spectacular murtis rich with lavish thrones and royal attire. You don't need to book in advance but please note that this is a place of worship, so shoes should be removed and no shorts or skirts shorter than knee length should be worn. Founded in 1774, Sotheby's is the world's oldest art auction house. Sales today command record sums for items. Notable sales range from 'Danseuse au Repos' (Degas' pastel of a ballet dancer) which set the world record for an artist at auction with a price of £17,601,500 ($27,930,020), to John Lennon's Gallotone 'Champion' acoustic guitar which sold for £155,500 ($251,700) at a Rock'n'Roll memorabilia sale. Check the website for dates and details of individual auctions and then head over to witness some of them in action. It's free to attend and you can often catch a glimpse of some truly historic items going under the hammer. London's only example of neo-Byzantine architecture and principal Roman Catholic church, offers a magnificent campanile that emerges 274 feet into the sky. While 12 million burnished terracotta coloured bricks adorn the exterior, parts of the interior remain poignantly bare - a potent reminder of the lack of funding which plagued construction in 1895. Plain walls and simple candlelight form a stark contrast to the colourful mosaics and marbles, and Eric Gill's nave detailing the fourteen Stations of the Cross. Walk or take the lift up (the lift is now charged at £5) the campanile for some spectacular views of the capital. Visitors are reminded that this is an active place of worship. From cheap budget places to stay to luxury 5 star hotels see our discounts for hotels, including Hilton London Islington Hotel from 68% off.